Why is WhatsApp Worth $19B? How do Free Apps Make Money? Some build apps for fun. Others for profit. 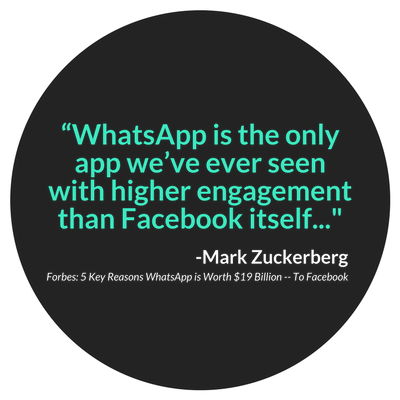 No matter your interest in apps, here is something for you: Facebook just purchased WhatsApp…for $19 billion. $19 billion—yes, with a “b”! What? Why? How Is It Possible For A Free App To Be Worth So Much Money? Sounds Cool. Sounds Neat. But Does It Sound Like $19 Billion? 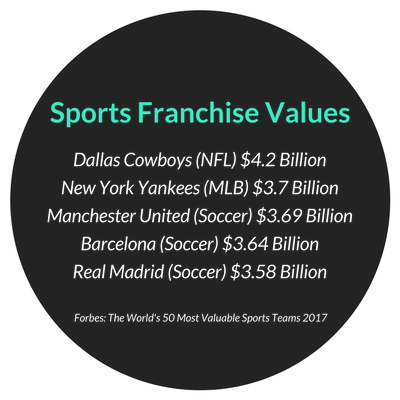 How about the most valuable sports franchise in the world, Manchester United (valued at $2.23B by Forbes), along with Real Madrid ($1.88B), the New York Yankees ($1.85B), the Dallas Cowboys ($1.85B)…get the picture? It’s easier to wrap your head around the value of these teams. Man U has over 650 million fans, the Yankees own a piece of the most profitable regional sports network in the country. Value here is more tangible. But How Does An App Like WhatsApp Make Money? Just like other products, apps earn money when they are purchased. $.99 per purchase might not sound like a whole lot, but it adds up (Angry Birds sells for $.99, just saying). Then of course you look at an app like Minecraft: Pocket Edition that sells for $6.99 and made $1 million in iOS App Store revenue—on Christmas day alone. For WhatsApp specifically, the app used to cost about $1 to download...to some. Meaning, that price tag was only present in certain countries, and was dependent on the device you were using. Other users around the globe actually got to experience the app for free for year one, but then pay $1 for each year following. In 2016, WhatsApp scrapped the subscription fee altogether. Before 2013, those on the iPhone had to pay $1 as a one-time fee to download and use the app. It was then decided to put iPhone and Android users on the same level, making the app free for everyone, regardless of device, for the the first year, and then $1 per year to follow (while existing users were grandfathered into their existing one-time $1 fee; as long as they didn't change their phone number). On top of all of that, as mentioned, some countries were never subject to any fee. Even "free apps" or those that are free to download can still make money, and lots of it. This freemium model allows users to download the app without charge, but will then charge for extra features, lives, power-ups, and other in-game resources. Think Candy Crush and Clash of Clans, and even the newer version of Words with Friends. You’ve probably noticed advertisements on your favorite apps. (How can you ignore them?) Just like ads on social networks, in magazines, on TV, etc. companies pay for their products and services to be seen within mobile apps. While WhatsApp hasn't yet cashed in on this tactic, other SMS apps, like WeChat, which is well known in China, has both apps and online games. With only 440 million users, WeChat turned in $924 million in revenue in 2014's third quarter. All of that said, it still doesn't add up; literally. All of this considered, there is one big thing missing. I mean, if WhatsApp earns $1 per download on iOS and $1 per year on other platforms (and not even for every user). Even with a large user base, the company’s revenue might only be hundreds of millions of dollars. Thus, there is a large, unfilled gap between hundreds of millions and $19 billion. But, maybe, it doesn't have to add up. So why was so much offered for WhatsApp? Because that is how much the app is worth to Facebook. 450 million users at the time of purchase, growth opportunity, future prospects, behavioral data, contact lists, keeping the app out of the hands of competitors. All of these things have a price tag. And a hefty one, it appears. Thus, valuation here doesn't stem from past, current, or even near future revenue prospects. The app had millions (now a billion plus users). Such volume opens the door for revenue, at some point, in some form. It's not about how the app makes money now. It's about whether or not it can make money when the right monetization strategy is rolled out—with said strategy hinging on a high volume of users, which WhatsApp has. When the time comes, Facebook can expect billions of revenue, as outlined here when looking at the WeChat and Line revenue models. If I had such a future-telling capability, I'd probably consider using it on something other than predicting WhatsApp's next move. But, it's fun to think about. Above all else, growth prospects are tremendous. As with most apps, and especially with a messaging app, one person in a group of friends downloads, then the rest follow. Then, the social groups of those people all take to adoption, and so on as the app branches out from one group to the next. Taking both the app's existing and quickly expanding user bases into consideration, WhatsApp is primed for profiting—again, when the time comes. So, just something to keep in mind when building your own apps. There are many ways to get compensated for your creations, but who knows the value others will place on them. View Programming Courses at iD Tech, learn more about how kids can learn to code online, or download our 2018 brochure via the button below.